I am back from the 45th annual Division of Planetary Sciences meeting in Denver, Colorado, where I presented my findings on the study of the triple asteroid system (87) Sylvia through a poster and in a press conference (video here). Located in the asteroid main-belt, we know that (87) Sylvia possesses two moons since our publication in Nature Journal in 2005. Our team has combined observations from professional-class telescopes and from small telescopes used by amateur astronomers to reveal that this 270-km diameter main-belt asteroid has a complex interior, probably linked to the way the multiple system was formed. 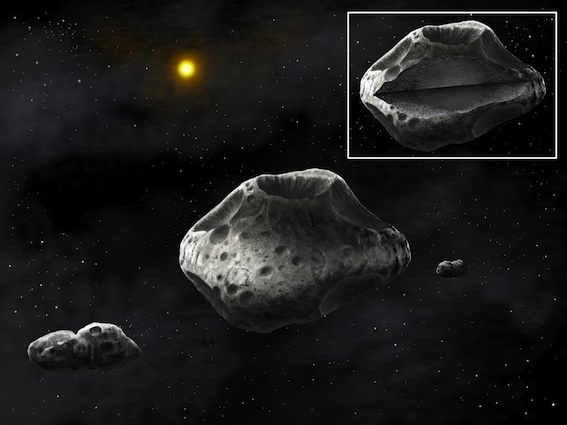 Since the discovery of its second moon, we have continued to observe this triple asteroid system by gathering 66 adaptive optics observations collected with various 8-10m class telescopes such as the W.M. Keck Observatory, the Very Large Telescope and the Gemini North telescope. Because (87) Sylvia is a large, bright (V=10.5) asteroid located in the main belt, it is a great target for the first generation of adaptive optics systems available on these large telescopes. We have combined data from our team with archival data to get a good understanding of the orbits of these moons. 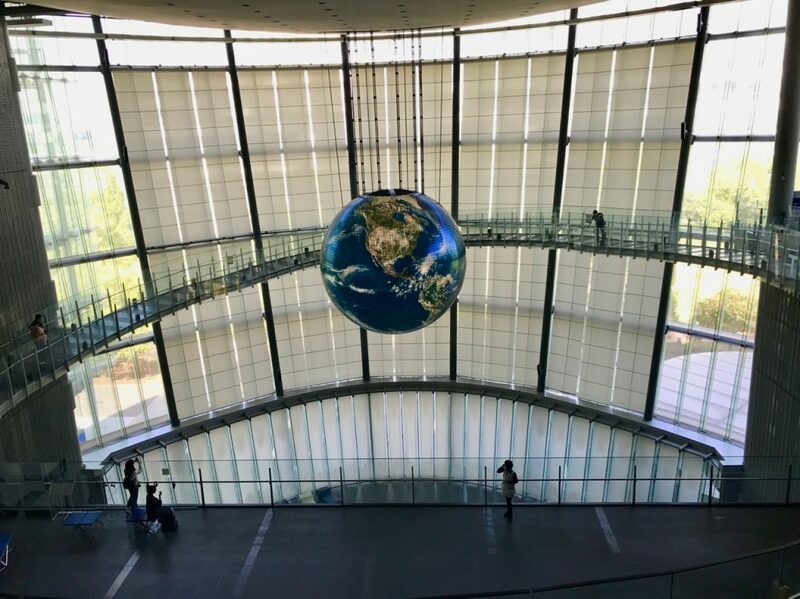 With expert assistance from colleagues at the Institut de Mécanique Céleste et de Calcul des Éphémérides (IMCCE) of the Observatoire de Paris, we developed an accurate dynamical model of the system, allowing us to predict the position of the moons around the asteroid at any time. The “drop test” of this work was the prediction of the relative positions of the moons during an occultation on Jan. 6, 2013. 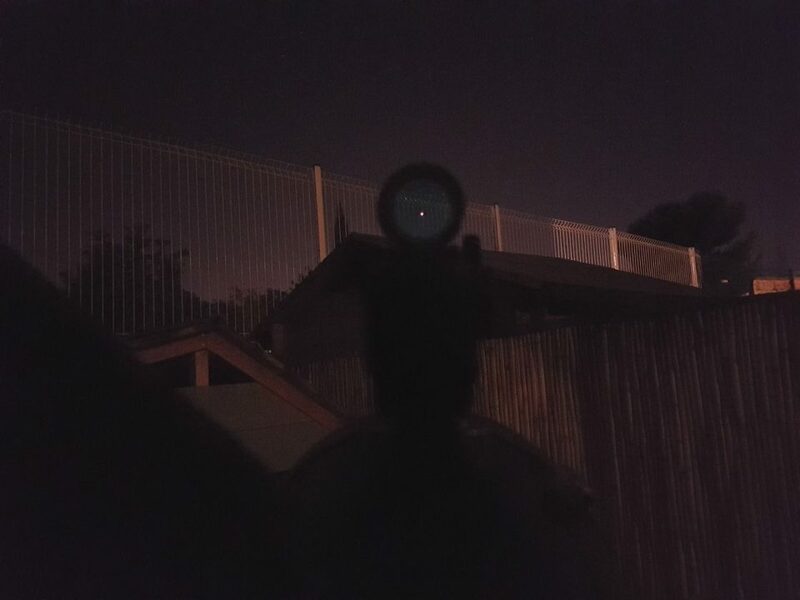 Observers equipped with small telescopes located on a narrow path across the south of France, Italy and Greece could see the triple system (87) Sylvia occulting a bright 11-mag star. 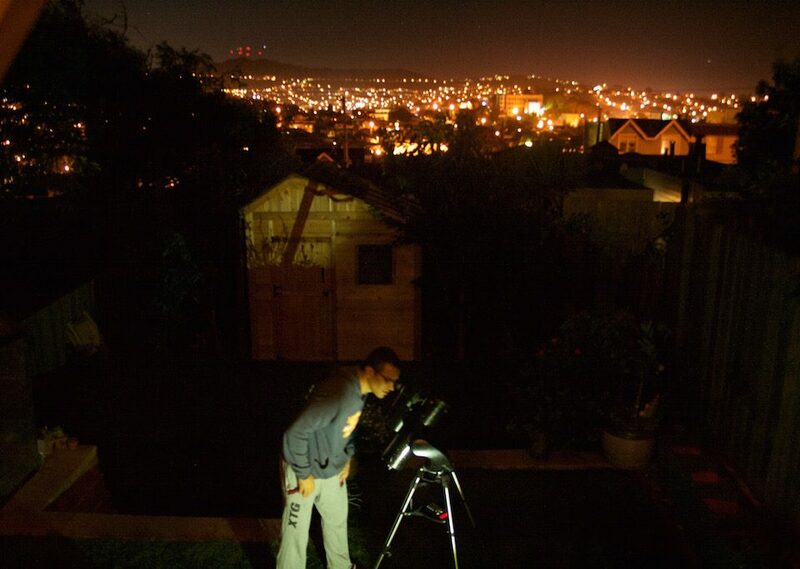 In collaboration with EURASTER, a group of amateur and professional astronomers, the team successfully motivated ~50 observers to watch the event. Twelve of them detected the occultation by the primary of the system which lasted between 4 and 10 seconds depending on their position on Earth. 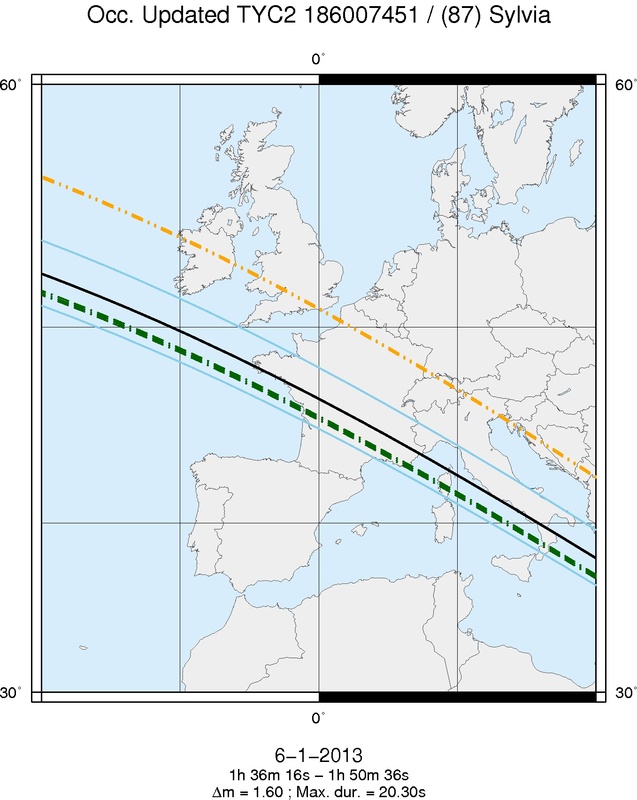 Additionally, four observers also detected a two-second eclipse of the star caused by Romulus, the outermost satellite, at a relative position close to our prediction. This result confirmed the accuracy of our model and provided a rare opportunity to directly measure the size and shape of the satellite. The chords of this occultation revealed that Romulus is a body 24 km in diameter with an extremely elongated shape, possibly made of two lobes joined together. This is not surprising if the satellite formed from the accretion of fragments created by the disruption of a proto-Sylvia by an impact, which occurred several billion years ago. We derived the shape of the 270-km primary asteroid Sylvia by combining data from the occultation of the asteroid with other sources of information. These included archived recordings of the variation of light caused by the spin of the satellite, and direct imaging by adaptive optics systems. Because the satellites’ orbits do not seem to be affected by the irregular shape of the asteroid, we concluded that the large asteroid is most likely differentiated. The asteroid likely has a spherical core of dense material, surrounded by a fluffy or fractured outer surface layer. Combined observations from small and large telescopes provide a unique opportunity to understand the nature of this complex and enigmatic triple asteroid system. Thanks to the presence of these moons, we can constrain the density and interior of an asteroid, without the need for a spacecraft’s visit. Knowledge of the internal structure of asteroids is key to understanding how the planets of our solar system formed. I would like to thank NASA PAST NNX11AD62G for their support and Danielle Futselaar for her fantastic drawing. This work is about to be submitted to Icarus Journal (Berthier et al. 2013). Let me know if you want me to send you the submitted version. 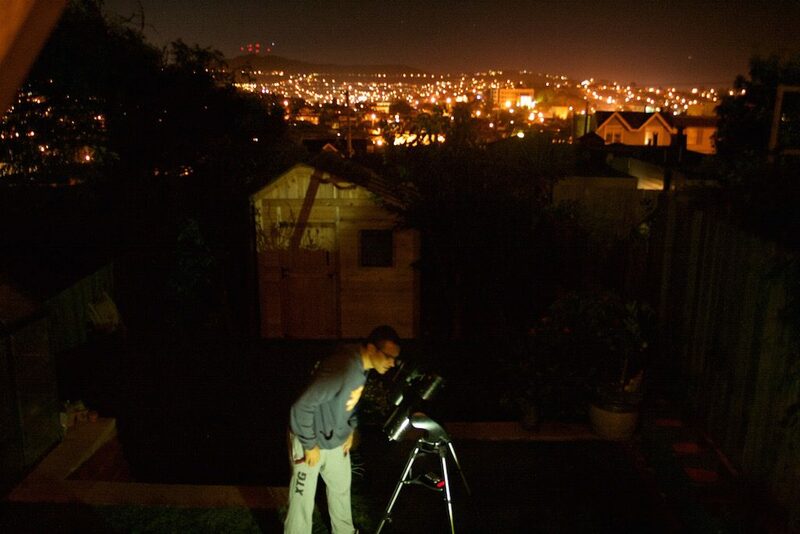 The setup to observe Pluto from my backyard in San Francisco (September 22 2017 PT).